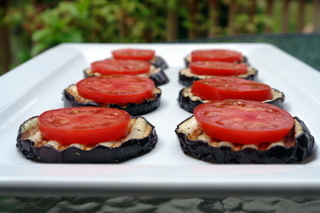 This is one of my favorite appetizers, occasionally we like to have appetizer dinners, which is just appetizers for dinner -it’s an adult version of ice cream for dinner – and this eggplant appetizer is one of those yummy appetizers that always gets included. 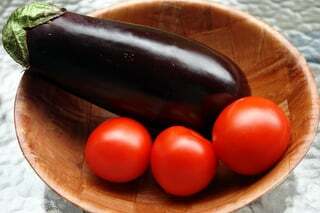 It is especially good in the summer when you can get the best quality eggplants and tomatoes. 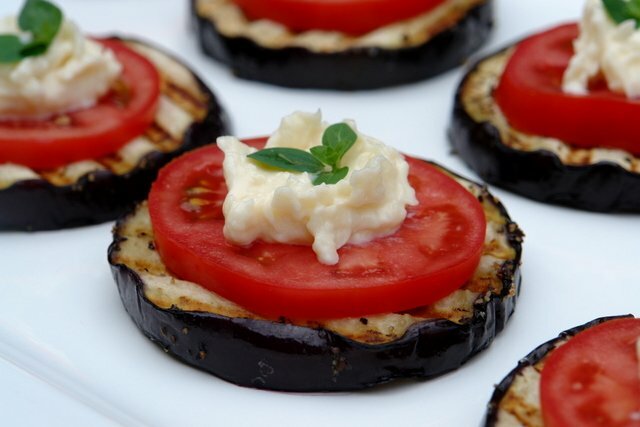 The combination of eggplant and tomato gets a very spicy contrast from the garlic parmesan mayonnaise sauce, which I really think that sauce is the key to making this appetizer so delicious. Even though I’ve made this eggplant and tomato appetizer so many times I still remember Anna’s as being so much better than mine, she always used dill as the garnish. I use it sometimes but it just depends what I have in the garden or fridge, this time I used thyme and oregano as garnishes. 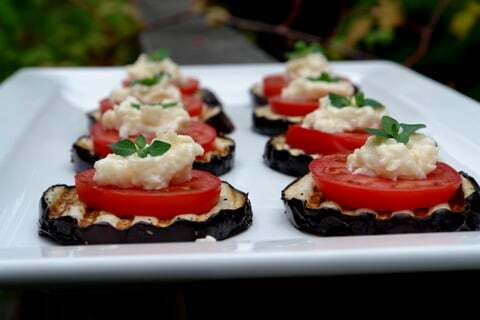 Grilled eggplant slices topped with tomato slices, garlicky parmesan sauce and fresh herbs. 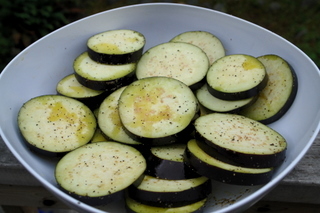 Slice eggplants, toss with olive oil, salt and pepper. Grill until the eggplant slices are cooked, about 5 minutes on an electric grill, you can also fry or bake the eggplant slices. 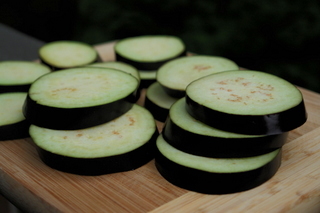 Arrange the eggplant slices on a plate, top each one with a slice of tomato and a spoon of the garlicky parmesan mixture. Garnish each appetizer with a fresh herb sprig and serve warm or cold. 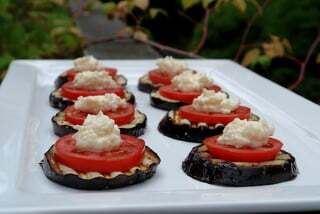 I learned how to make this eggplant appetizer from my friend Anna, back in the days when we lived in Austin and hung out with a very fun group of Russians. We met Anna, who is Polish, and her Russian husband Victor thanks to our Russian neighbors Vadim and Geanna. We all lived in the same apartment complex and had some great dinner parties – Russians definitely known how to party. Anna would usually bring this appetizer to these dinners. Another interesting thing about Anna is that she has an identical twin sister and Victor has an identical twin brother, and they met at the house of another friend who is also a twin, what are the chances of that? Thank you Anna for this great appetizer! Looks delicious and amazing pictures…..!!!!!! 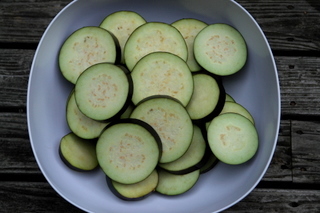 Made as a side dish for dinner tonight with out garden grown eggplant & tomatoes. Can’t wait to make again! Fantastic! I just found your site cause I was given a box of organic eggplants and don’t know what do with them. I’m a Texan married to a French man, living in France, and I’m always searching for different ideas for apéritif. This recipe looks great! Thank you, gracias, et enfin, merci! I made these when had some friends over for a barbeque. They tasted great, though they didn’t look as nice as your photos! I will be making these again. I added some dried dill to my mayo-parmesan mixture and topped it with Parsley. 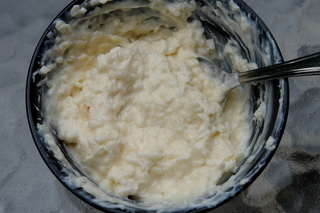 I made this with veganaise because we were having vegan friends over. I added chives, basil and 1 clove of garlic. Everyone, including the meat eaters LOVED it. I have never had such flavor with eggplant. I used all local, in-season veggies and herbs. For us non-vegans I added some high-quality Parmesan. Totally yummy. I will use to this recipe again. We ate a rolled version of this in Kazakhstan. 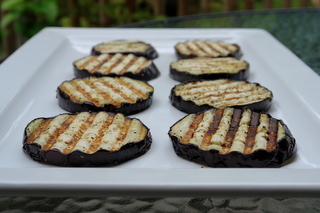 The eggplant was thinner and grilled until soft enough to roll. The tomatoes were Russian heirlooms and very, very ripe. I don’t remember any cheese in it. Just seasoned grilled eggplant, thinly sliced tomatoes, and a dollop of garlicky mayonaise (the good stuff, not our American mass-market stuff). 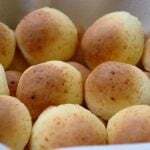 They were layered, then rolled up, held together with a round tooth pick, and were served cold. They called the dish, “Mother-in-law’s Tongue”. This looks great i think it will be a new hit for my fiance and i its good to try something new muah! I made this last night for a holiday party. It was a big hit. The first appetizer to disappear. Next, time I’m going to use plain yogurt in place of the mayo. Yummy! I’ve been using your website a lot!!!! Congratulations and thanks for such a neat website. This recipe is spectacular, easy and delicious! Joe loved it. We just finished having dinner and I couldn’t help but comment on it. Say hi to Anna if you are still in touch with her. I remember her. We miss you here in Austin. Bye and enjoy our lindo Ecuador! Thanks for sharing such beautiful pieces, I just love how you illustrate the making of all your dishes. I was craving a potato soup and found your website. I have a question for you…do you have a recipe for Creamy Pesto Sauce? Thank you Jeanette, I don’t really have a specific recipe for pesto, I usually just crush basil leaves with some garlic, pine nuts, a little bit of lime juice and some olive oil as well as salt. I just found your site today and WOW, this is exactly what I want to eat! With all the tomatoes and eggplants I find the farmers market, I’m going to try this on Sunday! Mmmmm! I had too many tomatoes lying around and too many eggplants as well. I was looking for some ideas for lunch when I came across your post. OMG! This is amazing! I mean, I figured it would be good but that garlic Parmesan mayo sauce is amazing. I can’t wait to use the leftover mayo on other stuff. So simple and so delicious! I love it! Thank you! That looks good! Nice presentation. Awesome photos! This actually fits with the red&white theme for Foodie Photo Contest that we have now. There’re some prizes for the lucky winners too. Don’t forget, deadline for submission is Aug 18th. i love the simplicity of these appetizers. color, presentation, taste. lovely photos! Rosa – I love the colors also! 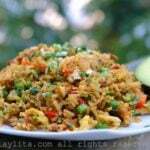 Lydia – I didn’t think of that, but you are right, definitely a good low carb dish! 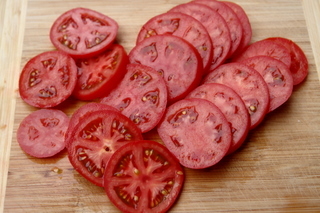 Maya – You are so lucky to have these growing on your patio (I’m really jealous), give it a try, it’s so easy and good! JS – How can you dislike eggplant? I kind of understand, I didn’t really like eggplant until I was in college, I just never had it prepared the right way. Claudia – I think this will be even better with heirloom tomatoes, great idea! Olga – I like the idea of making something like this baked, I’ll have to try it! This looks very pretty! And healthy and flavorful. My mom used to make something similar with eggplant and then top it with a mixture of mayo, garlic and parsley and bake in the oven! 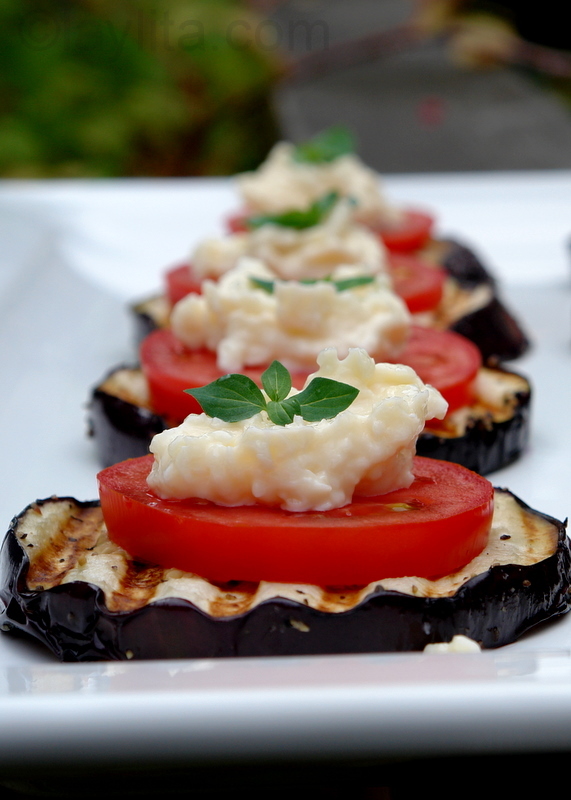 Looks delicious – a fantastic summer appetizer! I’ll try this recipe with heirloom tomatoes. This looks fantastic! I’ve been having some problems with eggplant lately (suddenly developed a dislike for the vegetable), so maybe this will set me back on track. This just looks so beautiful. What a great dinner this time of the year. I have tomato and eggplant plants on my patio full of fruits. This would be a good way to use them up! Great way to lighten up eggplant parmesan — and now that I’m eating a lower-carb diet and not having much bread, it’s fun to substitute vegetables for the bread in some dishes like this. 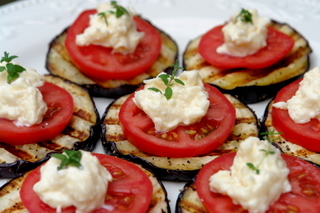 I just love eggplant and this looks delicious! Wonderful photos to help explain the process. Great job. That appetizer looks very good and so pretty!